Some people are known by the many words they speak while others say relatively little, but leave an awesome impression. Jean Quarterman Moore was known as a lady of few words, but she knew how to get the job done. Whether it was becoming the first African-American director of Children and Family Services for Liberty County, serving as president of Nu Rho Omega Chapter, Alpha Kappa Alpha Sorority or working as a clerk for Walthourville, Moore definitely made an impression on Liberty and Long counties. She died April 19 and at her wake on April 24, family and friends gathered to honor Moore’s legacy and celebrate her extraordinary life, which exemplified service to everyone who knew her. A native of Liberty and Long counties, she spent endless hours helping others who were less fortunate. Moore volunteered her time and talent to many causes in the community and at her church. She served as a board member of the Coastal Area Support Team, a board member of Best Care Health Center and a member of the Walker High School reunion committee and the Community Conquerors of Liberty County. “She gave inspiration to many and was a person with an impeccable reputation for integrity. 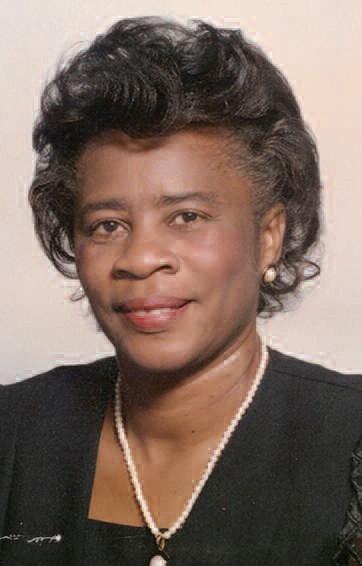 She served as a mother, deaconess, past trustee president, and finance committee member in her church,” said Dr. James Evans, pastor of St. James Baptist Church in Ludowici. “She was not a person of a lot of words, but she served well. She was one of the finest and most distinguished citizens in Liberty County. She became the first African- American case worker with the Department of Family and Children Services and then the first African- American DFCS director,” said Rep. Al Williams, who presented a resolution from the Georgia House of Representatives to Moore’s family. “When we started the Community Conquerors Committee of Liberty County after my son was killed in a tragedy in 1998, Jean was one of the first to volunteer. She was always available and there to support. She let me know that she loved me,” said the Rev. Christine Martin Seville, committee president. Moore was an active, longtime member of Nu Rho Omega Chapter, Alpha Kappa Alpha Sorority in Hinesville. Her sorority sisters attended her wake, recalling fond memories and telling stories about Moore’s legendary kindness. During the service, the sisters conducted an “Ivy Beyond the Wall” dedication ceremony. “Nu Rho Omega has lost a very good member and friend. Jean was a charter member and part of the chapter’s history. She was the sixth president and soror of the year three times,” said Beverly Pitts, one of the sorority’s past presidents. Pitts and other sorority members looked back on the laughable moments they shared with Moore during their sorority trips. Moore enjoyed traveling to Nu Rho Omega events. “Jean was her own person. If she were here today, she would say, ‘Continue to give your service to mankind because I am alright,’” Pitts said.